Photo: Senior regulators and policymakers from developing and emerging countries are gathered for the G-24/AFI Policymakers' Roundtable on Financial Inclusion on the sidelines of the 2019 Spring Meetings in Washington D.C. Technological innovations must form part of a multi-pronged approach that tackles gender inequality in financial inclusion and promotes greater female representation in top leadership positions, speakers said on 10 April at the 11th G-24/AFI Policymakers’ Roundtable on Financial Inclusion. Around 100 senior regulators and policymakers attended the event traditionally held by two organizations during the IMF/World Bank Spring Meetings. This year, discussions focused on how digital financial services (DFS) and financial technology (FinTech) leverage women’s access to quality and affordable financial services and promote greater gender equality. “Research suggests that when a woman has her own bank account, as opposed to relying on male family members, her status in the family and community and participation in decision-making is enhanced,” said Bangladesh Bank Governor and AFI Board Chair Fazle Kabir in his opening remarks at the International Monetary Fund (IMF) headquarters in Washington D.C.
Presenting progress made in implementing the Denarau Action Plan on women’s financial inclusion, Bank of Zambia Deputy Governor and Chair of AFI Gender and Women’s Financial Inclusion Committee Dr. Tukiya Kankasa-Mabula used Bangladesh as an example of where DFS had helped boost national financial inclusion rates but largely to the advantage of men. That had, she said, resulted in a widening of the gender gap to 21 percent in 2017 from 9 percent in 2014. Dr. Tukiya also shared how in championing women’s financial inclusion, AFI has established a strategic implementation framework that is overseen by the committee she chairs and includes AFI’s working groups, regional initiatives, public-private dialogue (PPD) partners and key stakeholders. 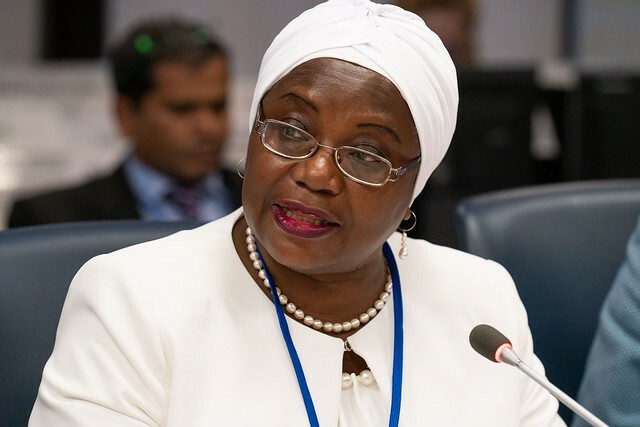 With its stakeholders, she said, AFI works collectively and individually among the member countries. AFI member institutions adopted the Sochi Accord on FinTech for Financial Inclusion in 2018, that emphasizes FinTech solutions for closing the gender gap. AFI’s DFS Working Group (DFSWG) is currently developing a policy framework on gender and DFS/FinTech, with support from MicroSave Consulting (MSC), a global firm that advises lenders on sustainable financial services. “We’re hoping to be able to adopt this framework in Kigali at the 2019 AFI Global Policy Forum,” Dr. Tukiya concluded. MSC also presented at the roundtable. Their recent study showed that after reviewing women’s financial inclusion policies in roughly 40 countries, there was often little coordination, if any, between national financial inclusion strategies and gender policies. Associate Director Bhavana Srivastava also highlighted how women’s use of DFS – particularly with mobiles – was growing, but that it still lagged behind men. Citing the many challenges faced by women in accessing formal financial services – including limited financial literacy, ownership and the power dynamics within the household – leaders emphasized the need for immediate action. To further these goals, Governor Zandamela said that state actors must fulfil their high-level policy commitments and make women’s financial inclusion a reality. While he acknowledged some national successes, he noted that gender disparities were “getting worse” in certain jurisdictions, citing examples in Africa and Bangladesh. In Egypt, female ownership of bank accounts had tripled from 2014 to 2017, yet the gender gap had also widened by 2 percent to 12 percent, Central Bank of Egypt Deputy Governor Lobna Helal explained. Nevertheless, she was positive about the recent developments, saying that Egypt was “on the right track” thanks to a clear financial inclusion strategy in which gender considerations were featured “in every pillar and every aspect”. Among the key expansion areas were mobile wallets and microfinance. Both feature elements - such as tiered and simplified know-your-customer (KYC) requirements – that circumvent common challenges faced by women in accessing formal banking services, including limited financial literacy, formal identification, assets and mobile phone ownership. Central Reserve Bank of Peru Chief Economist Adrian Armas also reiterated how technology can help provide women with the necessary tools to build and save assets. “Fintech companies can greatly facilitate payments, loans, and remittances; and the innovations they are bringing into the financial market can significantly favor financial inclusion among the population in general and women in particular,” he said. Armas also drew attention to progress in Peru, where the Ministry of Women and Vulnerable Populations has enacted a national gender equality policy “with the aim of eliminating inequality by addressing issues that limit women’s fundamental rights and personal development opportunities”. Swedish International Development Cooperation Agency (Sida) Associate Director General Dr. Cecilia Scharp added that with women making up half of the global population, it is in the national interest to get them “economically active and contributing to inclusive economic growth” in order to lift the tax base, domestic revenue and contribute to government spending. Sweden’s foreign policy placed “gender and gender equality” discussions at its core through the three “Rs” - rights, representation and resources. “Sida works on the first conviction that gender equality is not only a role in itself, but that it is a means for reaching other development goals and should be integrated and analyzed and addressed in all programs,” Dr. Scharp added. Referring to the different country experiences highlighted during the roundtable, AFI Executive Director Dr. Alfred Hannig said women’s financial inclusion was a global challenge that “cannot be solved by individual players” and required a “change of mindset”. He noted, for example, that out of 110 AFI member institutions from emerging and developing countries, only seven were led by women. Furthering this point was IMF Deputy Director for Monetary and Capital Markets Ratna Sahay, who highlighted the organization’s research on the gender compositions of the board members of commercial banks and regulatory agencies in nearly 100 countries. Among its conclusion were that greater female representation at the board level leads to higher economic growth, greater institutional financial stability and lower income inequality. However, only 2 percent of women are CEOs in commercial banks, according to their study, Sahay said. World Bank Vice President for Equitable Growth Ceyla Pazarbasioglu added that technological infrastructure was “not equally shared by men and women”. “Women don’t have [as much] access to the internet, mobile phones and so on and so forth,” she said, adding that financial literacy as another major topic for the World Bank with many programs currently in place to promote financial education. “There are a lot of risks for women also and other customers and [this is] one of the things that Her Majesty has been working on together with the World Bank, IMF and AFI, and many other partners in trying to understand,” he said. G-24 Secretariat Director Marilou Uy added that despite being a non-traditional topic for central bank governors and regulators, it resonated with everyone at the meeting. AFI Executive Director said that systemic biases made global partnerships and platforms vital to advancing gender and women’s financial inclusion. “We want to open up and drive these issues, not only within our own space, but across the board together in a coordinated way,” he said, adding that while more alignment was needed, it was vital “to have platforms to bring us together to form a consensus on the issues”. AFI’s partnership with G-24 involves being at the forefront of topics that impact financial inclusion, influencing the global dialogue with perspectives from developing and emerging countries, from both networks. Sida is the primary supporter of AFI’s global gender and women’s financial inclusion workstream under the Denarau Action Plan, with additional support provided by AFI’s funding partners. The G-24, originally called the Intergovernmental Group of Twenty-Four on International Monetary Affairs and Development, gathers twice annually for its Spring and Fall meetings. Members consist of central banks and finance ministries from 24 developing and emerging countries, many are also members of AFI’s membership network of 101 financial policymaking institutions from 89 countries. Sida is a government agency working on behalf of the Swedish parliament and government, with the mission to reduce poverty in the world. Through its work and in cooperation with others, it contributes to implementing Sweden’s Policy for Global Development. MSC is a global consulting firm that advises lenders on sustainable financial services. From its head offices in India and Kenya, it operates in over 50 developing countries to drive financial, economic and social inclusion through market-led solutions. Move your mouse over the photo and click the arrows pointing left/right to flip through photos in the gallery.